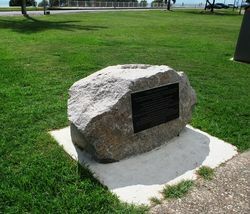 A monument commemorates the centenary of the ANZAC landings at Gallipoli in April 1915 during World War One. The 100th anniversary of the landing at Gallipoli was commemorated in a combined parade and Dawn Service in George Clayton Park on 25 April 2015 by the Wynnum and Manly-Lota RSL Sub-Branches and the Brisbane East and Bayside Branches of the National Servicemen`s Association of australia. An estimated 15,000 people attended. The flags of Australia, New Zealand, Great Britain and Turkey were flown.